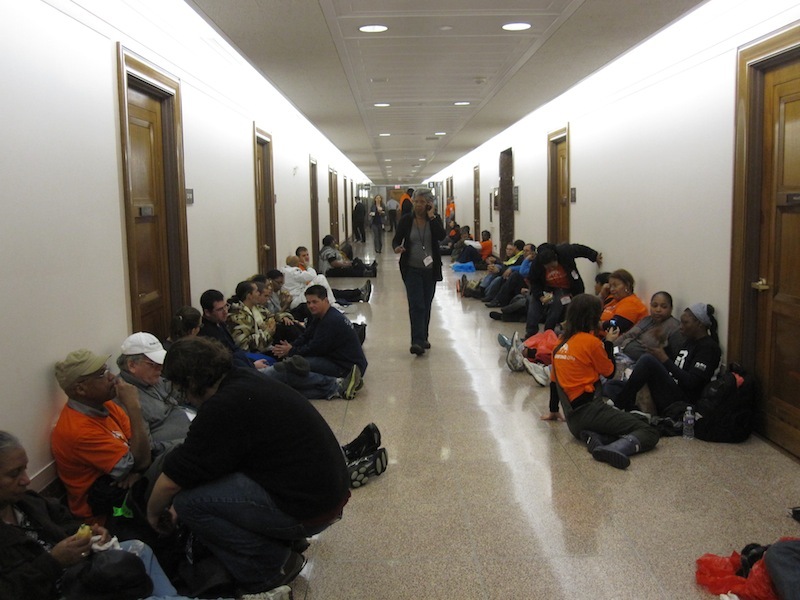 Take Back the Capitol stormed Congressional offices today, calling for more action to help the unemployed. This week, “Take Back the Capitol” brought hundreds of self-proclaimed 99 percenters to Washington in hopes of impacting key legislative battles that will take place between now and the end of the year. Thousands are sleeping either in pitched tents near the national mall, or in church basements, union halls and community groups throughout the city—and participating in mass action during the day. While clearly akin to the Occupy movement—many of the people I spoke with today came from Occupy encampments across the country—there is also heavy labor involvement in this push, with several union groups, most notably SEIU, lending organizing muscle. And unlike the deliberately non-electoral Occupy movement, “Take Back the Capitol” came directly to lawmakers’ offices with specific goals: primarily extending unemployment insurance, passing a jobs bill, taxing the wealthy and not cutting too deeply into domestic spending. Tuesday’s action involved splitting into state-by-state delegations and visiting Congressional offices to push for these specific requests. Some members, like Representative Chris van Hollen of Maryland, spoke to the protesters, while many others did not. I spent the day with the Massachusetts delegation, one of the largest of the state groups. About half of them—more than 100 people—marched to the office of Senator Scott Brown and arrived a little before noon. They massed inside and nearby his office, and requested to speak with the senator. A staffer told the group Brown was “not available,” but offered to take two or three demonstrators to speak with Brown’s chief of staff, provided the conversation was not recorded. The demonstrators rejected that offer and announced their intention to wait for the senator. They promptly made themselves comfortable on the couches, chairs and floor inside Brown’s office. Dozens more demonstrators lined the hallway outside—this completely prevented Brown from coming into his office unseen, since the only doors were in that hallway. Despite being in Washington and voting on the Senate floor today, Brown somewhat mysteriously never returned to his office after the protesters arrived. We waited for six hours, until the office closed, but Brown never showed up. His press staff would not confirm his schedule for me, nor say where he was. While we waited, I spoke with many of the participants. All of them were either unemployed or underemployed, doing part-time work or jobs that paid much less than they were accustomed to getting. They had a variety of very specific concerns: Medicaid cuts, the expiration of unemployment benefits, the failure of Congress to pass infrastructure bills or more general job bills. There was one arrest reported today, for unlawful entry, at the office of Missouri Representative Vicki Hartzler. Otherwise, the protesters that I saw were quiet and respectful of the rules. Tomorrow, “Take Back the Capitol” heads to K Street, where they plan action at the city’s powerful lobbying firms. We’ll be following the movement throughout the week, so check back for updates.